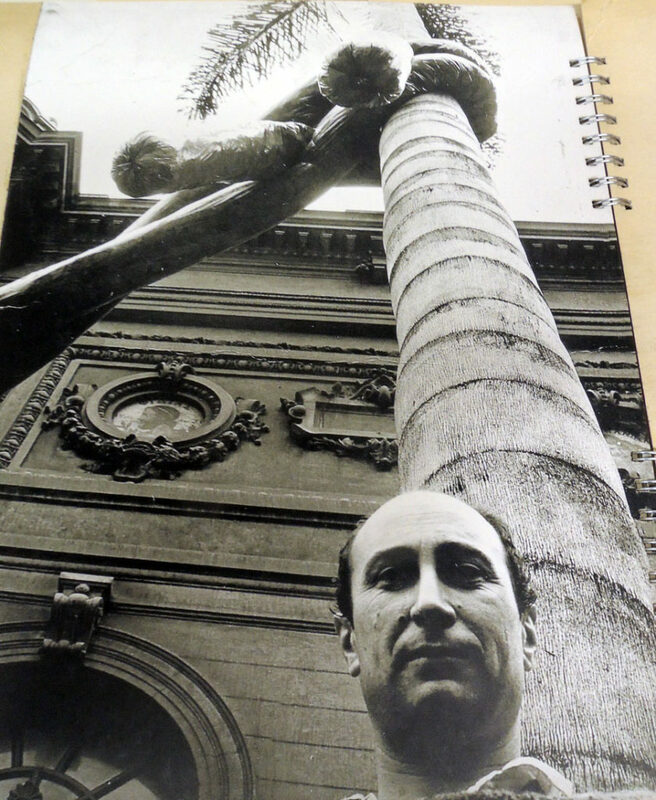 In October 1969, the Chilean sculptor Juan Pablo Langlois converted Santiago’s National Museum of Fine Arts (MNBA) into “en objeto de la primera intervención artística de carácter público” [the object of the first artistic intervention of a public nature]. 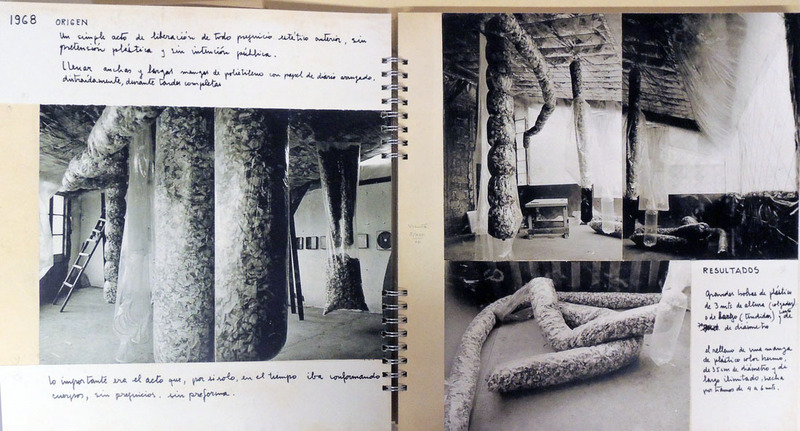 The work consisted of a large nylon sleeve filled with diaries, which began on the second floor, circled through the balcony, descended the staircase, and exited through a window, where it was tied to one of the palm trees in the front yard. 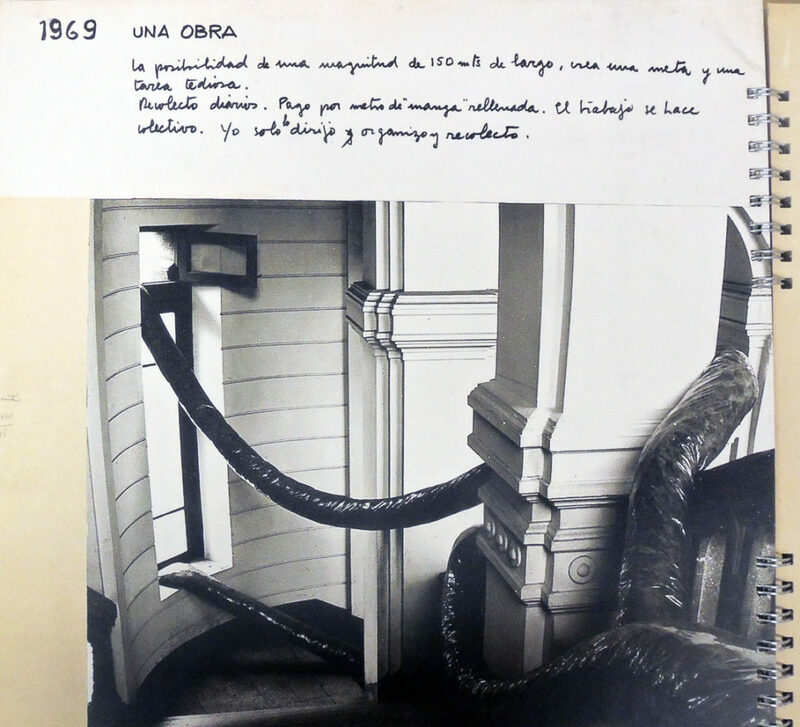 Forty years later, this seminal Chilean work of conceptual art was recreated on the second floor of the MNBA and a facsimile edition of the exhibition catalogue was published with drawings and photographs documenting the project. 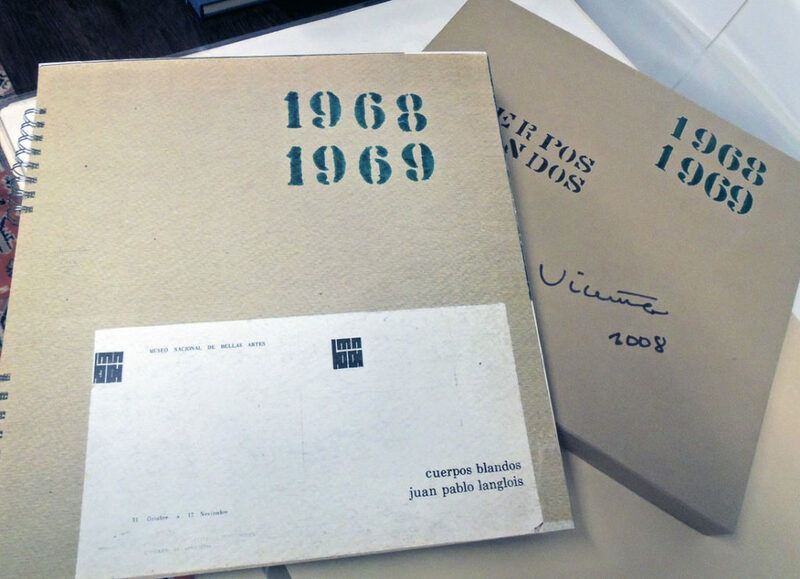 Thanks to the support of the Program in Latin American Studies, we are fortunate to acquire the rare, limited edition re-publication. “The Chilean sculptor, installer, and visual artist was born in Santiago on February 26, 1936. Between 1952 and 1962 he studied architecture at the Pontificia Universidad Católica de Chile and at the Catholic University of Valparaíso. He receives the influence of Joseph Albers, professor of the Bauhaus in a course of six months that the professor dictates in Chile. His first visual works are closely related to his training as an architect and consist of two-dimensional research on optical art. 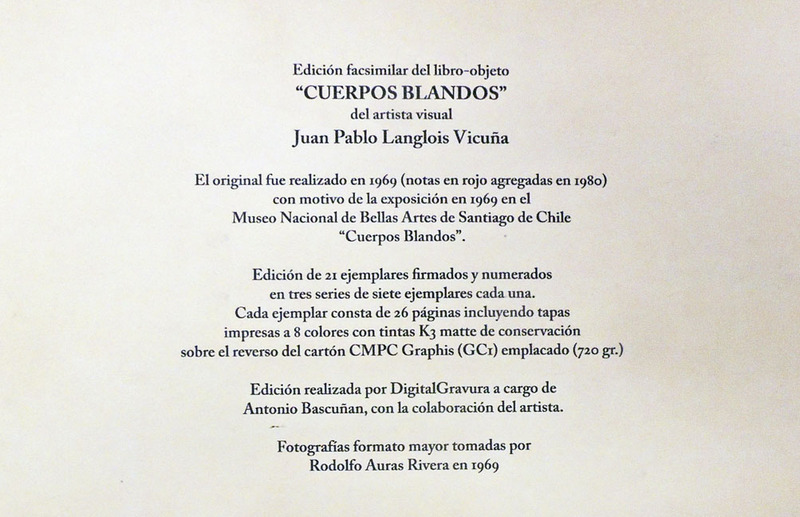 Juan Pablo Langlois (born 1936), Cuerpos blandos [facsimile]. 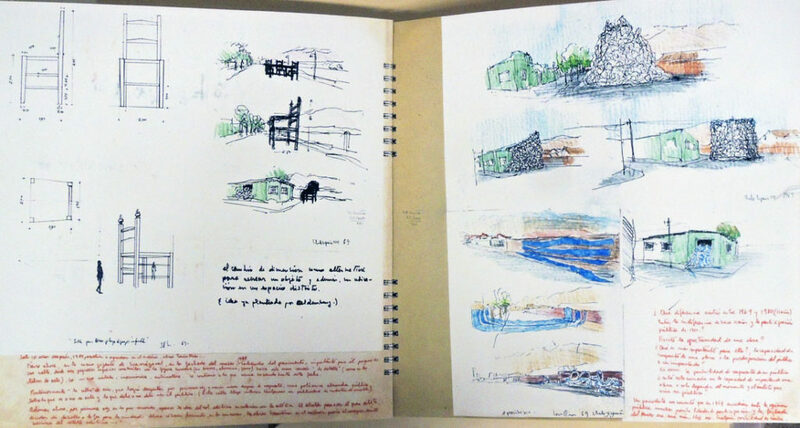 21st edition ([Santiago, Chile]: Museo Nacional de Bellas Artes, ). Catálogo de exposición de arte. Purchased by the Program in Latin American Studies. Copy 18 of 21. Graphic Arts Collection GAX 2017- in process. Cuerpos Blandos – Juan Pablo Langlois (2007) from pedro l. talarico on Vimeo. This entry was posted in Acquisitions, Artists' books on October 31, 2017 by Julie Mellby.